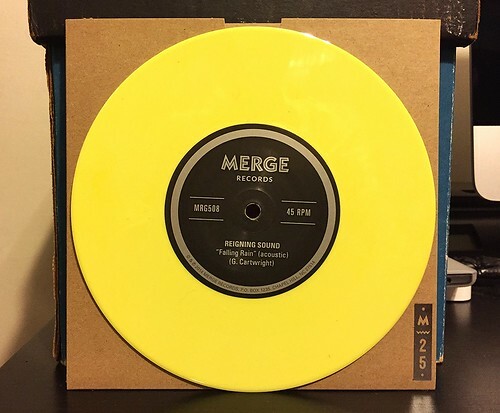 I'm going to spend the next few days getting caught up with the Merge singles series records that have been piling up. I've only got 3, but I imagine a couple more will be en route pretty soon. So let's clear this backlog. On the East River Pipe side there's a kind of slow song called "Did The Bank Boys Fool Ya." It's got distorted vocals with a pretty heavy echo effect on them. The song itself is somewhat simplistic and it almost reminds me of little kids' music. I've never heard of this band before and this song didn't really leave much of an impression on me. The flip side is an acoustic song by Reigning Sound. They are one of those bands that my friends all seem to like way more than I do. I think they're totally fine, but nothing they have done has really elicited the sort of emotion in me that I see in others. "Falling Rain" is primarily built on the strumming of an acoustic guitar with some hints of sliding steel guitar sounds in the background. It's a nice song actually, but not really anything I think is special or noteworthy. It's not bad, it just isn't the sort of thing I see myself listening to more than once or twice.